Tyler McCandless is a Machine Learning Scientist at the National Center for Atmospheric Research in Boulder, Colorado. He earned a three degrees in Meteorology from Penn State University: PhD - 2015, MS - 2010 and BS - 2010. After earning his doctorate, Tyler worked in industry until May 2018, with his previous position as Manager of Services at Ascend Analytics, which is a energy risk modeling software company in Boulder. In May 2018 Tyler was hired by NCAR as a Machine Learning Scientist and is responsible for providing high level machine learning expertise to various projects in the Research Applications Laboratory (RAL) at NCAR. Current projects include using machine learning techniques to improve wind and solar power prediction for a project in Kuwait, and building an algorithm to improve wildfire prediction. Tyler will participate in mission-relevant academic activities including conferences, workshops and tutorials as well as documenting research results by authoring peer-reviewed conference and journal publications, and publicizes those results in presentations at scientific meetings. Tyler married his wife Kristin in Estes Park, CO in December 2016. 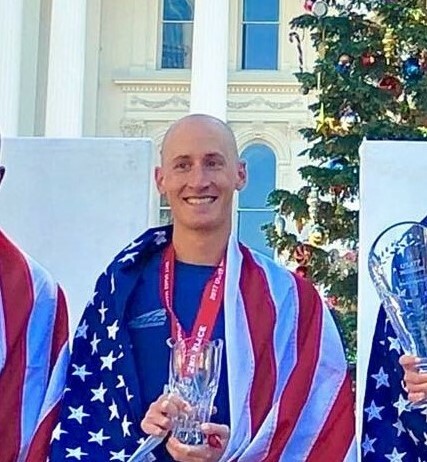 He is also a professional distance runner who has competed in two Olympic Marathon Trials and qualified for a third with his 2:12:28 marathon to finish 2nd at the USA Marathon Championships in December 2017. Lee, J.A., S.E. Haupt, P.A. Jimenez, T.C. McCandless, M.A. Rogers, and S.D. Miller, 2017: Solar Irradiance Nowcasting Case Studies near Sacramento, Weather and Forecasting, 56, 85-108. McCandless, T.C., G.S. Young, S.E. Haupt, and L.M Hinkelman, 2016: Regime-Dependent Short-Range Solar Irradiance Forecasting, Journal of Applied Meteorology and Climatology, 55, 1599-1613. McCandless, T.C., S.E. Haupt, and G.S. Young, 2016: A Regime-Dependent Artificial Neural Network Technique for Short-Range Solar Irradiance Forecasting, Applied Energy, 89, 351-359. Lee, J.A., W.C. Kolczynski, T.C. McCandless, and S.E. Haupt, 2012: Objective Techniques for Configuring and Down-Selecting an NWP Ensemble for Low-Level Wind Predictions, Monthly Weather Review, 140, 2270-2286. McCandless, T.M., S.E. Haupt, and G.S. Young, 2011: Statistical Guidance Methods for Predicting Snowfall Accumulation in the Northeast United States, National Weather Digest, 35 (2), 14 pp. McCandless, T.M., S.E. Haupt, and G.S. Young, 2011: The Effects of Imputing Missing Data on Ensemble Temperature Forecasts, Journal of Computers, 6 (2), 162-171.